As Kara tries to build a good working relationship with her sister Alex and the rest of her DEO team while they peruse one of the escaped alien criminals, Cat Grant begins to pressure James Olsen to deliver an interview with Supergirl. Superman: The Movie (the opening scene of Kara chasing the missiles as training mirrors the climax of this movie, the montage of Kara helping the people of National City mirrors Superman's first night as a superhero, right down to her rescuing a little girl's pet from a tree and the hologram of Alura In-Ze is straight from this movie), Superman II (the character of General Astra is basically a female version of General Zod), Man of Steel (the theme of distrust regarding an alien savior), various Supergirl comics, but particularly New Krypton, which dealt with a group of rogue Kryptonians on Earth and features Supergirl and her mother, Alura In-Ze, as prominent characters. Apparently the DEO has procedures for training an alien to become a field agent. Even though they didn't have any interest in recruiting an alien field agent last week. For that matter, they were able to get a fighting arena with Kryptonite emitters embedded in the wall built on a week's notice so Alex could teach Kara how to fight? Along with a private room with a Kryptonian A.I.? Mehcad Brooks is doing a great job bringing Jimmy Olsen to life. The best moment of the episode comes with his speech about wanting to be his own man and not depending on his relationship with Superman to define his career. Melissa Benoist continues to impress as Kara. She was born to play this role, managing to portray Kara as confident in the heat of battle but still scared senseless of her boss. On that note, it's worth noting that Calista Flockhart is very effective at playing Cat Grant as the kind of character you love to hate. The montage in which Kara flies around helping the people of National City under James and Winn's direction, set to Pat Benetar's Hit Me With Your Best Shot is magical. It shows off Kara's powers in a fun way and makes a far better "girl-power" statement than any forced dialogue with Director Henshaw. Dodging missiles and moving in such a way as to cause them to take themselves out is a fairly standard trick for both Superman and Supergirl in the comics. The line "This looks like a job for Supergirl" is a nod to one of the most famous lines from the classic Superman comics. Many heroes have appropriate the phrase since then, but the original wording was "This looks like a job for Superman." Kara's issues with saving the oil tanker during the dock fire are clever nods to the problems certain superpowers would have in regards to real-world physics. For instance, while Super-Breath is routinely used to put out fires with ease in the comics, any wind of sufficient force to extinguish a fire would run the risk of spreading the flames if not properly focused. And while Supergirl may have the strength to push an oil tanker, the side of the tanker may not be strong enough to withstand her pushing it with all her might. In the original DC Comics, Maxwell Lord was a shrewd and powerful businessman who was instrumental in the formation of Justice League International. Max later developed the ability to control the minds of other people, following the Invasion! storyline. Maxwell Lord's characterization has been amazingly inconsistent since his creation. Some writers portrayed him as an amoral con-artist whiles others depicted him as an easily-tempted but ultimately redeemable figure, who was inspired to be a better man by the heroes he managed. That all went out the window during Countdown To Infinite Crisis, where Max was revealed to be a criminal mastermind and secret leader of the organization Checkmate. It was further revealed that Max had used his position with the JLU to render the group ineffectual, so that humanity would have time to develop safeguards to protect itself from the menace of super-powered beings. The DCTVU version of Maxwell Lord seems to be cut from the same cloth as his earliest incarnation, being a businessman in National City who holds a low opinion of superheroes. He appears on TV speaking as to the negative effects Superman has had on Metropolis while pledging to use his fortune to clean up the oil spill Supergirl accidentally caused. Cat Grant drops the names of Lois Lane and Clark Kent when speaking disparagingly of "the hags" at The Daily Planet. Clark Kent is, of course, Superman's secret identity and Lois Lane is his chief rival - and later love-interest - at the Metropolis newspaper The Daily Planet. We get our first look at The Hellgrammite at Plastino Chemicals. This is named in honor of Al Plastino - the artist who co-created Supergirl, as well as the Superman villain Brainiac and The Legion of Superheroes. Hellgrammite is discovered in Sector 52 of Plastino Chemicals. This is a nod to the importance of the number 52 in the DC Comics Universe. In the original DC Comics, Hellgrammite was the name of a super-villain and enemy of Superman. Originally an entomologist named Roderick Rose, The Hellgrammite was created after Rose exposed himself to a mutagen that transformed him into a giant, grasshopper-like insect. The mutation gave The Hellgrammite increased strength, the ability to leap long distances, a super-dense exoskeleton and the ability to secrete natural adhesives that could be used to craft cocoons. He later developed the ability to transform other people into "larvae" under his control and worked as an freelance assassin before joining the super-criminal organization Intergang. In our world, Hellgrammite is also the technical name for the larvae of The Dobsonfly. It does not seem to have any relation to the super-villain apart from having a fearsome sounding name. They are popular as bait with angler fishermen. The DCTVU version of Hellgrammite is an alien. Hellgrammite is the name of his species. He is seen climbing on walls like a spider and has the jumping powers of his comic-book counterpart. Unlike the comics version, this Hellgrammite has poisonous stingers, which it shoots out of its hands. It is a shapeshifter, capable of posing as a normal human and has an enhanced sense of smell. It is not immune to its own poison and it dies after Alex Danvers forces it to stab itself in the chest with its own stinger. In the flashback, Alura In-Ze makes reference to the Kryptonian Military Guild. Before its destruction, The Military Guild was an organization which combine the duties of police officers and military soldiers. They were charged with keeping the peace on Krypton. The idea of Kryptonians being easily beaten in a physical fight by Earthlings with advanced combat training once deprived of their powers is a fairly common trope in DC Comics. Early on, both Superman and Supergirl depended exclusively on their powers. Superman eventually sought martial arts training from Batman and Supergirl - in the post-Crisis DC Universe, at least - spent some time on Themyscira being trained by The Amazons. Cat Grant says that she started out as Perry White's assistant before finally getting a chance to write a gossip column for The Daily Planet. In the comics, Perry White is the editor of The Daily Planet. However, in the original comics, Cat was a successful syndicated gossip columnist in her home town of Los Angeles before she was hired at The Daily Planet, though she did wish to be taken seriously as a real reporter and attempted to infiltrate Intergang on her own to prove herself. General Astra In-Ze is an original creation unique to the DCTVU. Thus far, she seems to be a female version of General Zod, who just happens to be Supergirl's aunt. In both the comics and the movies, Zod was a military leader on Krypton who lead a military coup against what he saw as a corrupt and ineffectual government. He and his followers were punished with banishment to The Phantom Zone. Eventually they escaped and contested with Superman - usually over Zod's plans to conquer or destroy The Earth. Both Superman II and Man of Steel were based around the conflict between Zod and Superman. In most of the comic books - and both films - Zod bore a grudge against Superman's father, Jor-El. This episode establishes a similar conflict between Supergirl and General Astra, with Astra holding a grudge against her sister Alura. While the exact nature of Astra's crimes are not explained, she claims that her own sister imprisoned her for telling the truth. The name Astra has multiple meanings. In Greek, it means "star". In Latin, it means "of the stars". In Norse, it means "divine strength". Tellingly, Kara makes reference to her aunt showing her all the stars and telling her their names when she was a child. In the 1950s, DC Comics published a sci-fi series called Astra - Girl of The Future. The book centered on a futuristic television reporter named Astra. It is worth noting that one of Superman's many titles was The Man Of Tomorrow. Astra's two minions - while not named in the episode - are identified in the cast list for the episode as Commander Gor and Lieutenant Mur. Gor and Mur are based on two characters from the original Superman comics. They appeared in the Return to Krypton story-line, where they were two of the 600 soldiers trapped in the Kryptonian city of Kandor, which was shrunk, trapped in a bottle and stolen by the evil A.I. Brainiac. Later, when Superman found a way to restore the city, they learned of General Zod's imprisonment in The Phantom Zone, and bargained for his freedom. They later served under General Zod when he attempted to declared war on Earth. The DCTVU versions of Commander Gor and Lieutenant Mur appear to serve a similar function, save that they are underlings of General Astra rather than General Zod. The first crime James and Winn send Kara to stop is the armed robbery of a pizza place on 5th and Sigel. This is a reference to Jerry Siegel - the writer who, along with artist Joel Shuster, created Superman. The next problem James and Winn send Kara to help with is an ambulance stuck in traffic on Donner Avenue. This is a reference to Richard Donner - the film director who, among other great movies, directed Superman: The Movie and most of Superman II. Saving kittens from trees is another classic superhero trope. Superman does it in Superman The Movie. This may be the first time, however, that the pet a superhero needed to rescue was a snake. The exact meaning of the stylized S-Shield used as an emblem by Superman and Supergirl has changed over the years. Originally, it was indeed a stylized-S. It was first used as a coat of arms for the House Of El in Superman: The Movie, at the suggestion of actor Marlon Brando. Both the 1987 comic mini-series Man of Steel by John Byrne and the novelization of the 2006 movie Superman Returns by Marv Wolfman made reference to the S being a stylized snake. The former story said that Jonathan Kent designed the emblem based on a Native American legend regarding the snake being the symbol of the healer. The later story said the shield was a Kryptonian symbol, representing one of the three great houses that helped to stabilize the planet after a violent civil uprising. The snake-coiled-in-a-shield emblem was meant to be a symbolic warning against returning to the ways of violence and treachery. The 2004 comic book story Birthright established the idea of the S-Shield being the Kryptonian symbol for hope - an idea that was later utilized in the 2013 movie Man of Steel. Writer Geoff Johns confirmed that the S-Shield was both the Kryptonian symbol for hope and the coat of arms for the House of El in his story, Superman: Secret Origins. The idea put forth in this episode - that the S-shield is also the family motto of The House of El and meaning "stronger together" - is a new conceit. Director Henshaw makes reference to having had a family once. In the original comics, Hank Henshaw lost most of his family due to the space-shuttle crash that gave him super powers. Alex makes a reference to Superman having a hidden base - a fortress - in the Arctic. This is a reference to The Fortress of Solitude. She also makes reference to the base allowing him to commune with his Kryptonian ancestors, though it is not explained how the DEO knows this. The DEO set up a similar room to what they believe is in The Fortress of Solitude, using an interactive artificial intelligence program culled from living memory, located in the rocket that took Kara to Earth. This artificial intelligence takes the form of Kara's mother, Alura In-Ze. This is just like the interface Jor-El created to run the Fortress of Solitude in Superman: The Movie. Later Superman movies revealed other Kryptonian elders made manifest through the Fortress' computer. We see Director Henshaw's eyes flash red at the end of the episode. This may be another reference to his eventual fate as The Cyborg Superman, who also had red glowing eyes in some artistic interpretations. The DEO determine that the chemical factory The Hellgrammite was robbing manufactured sodium hypochlorite and ammonium nitrate. Sodium Hypochlorite, when dissolved in water, becomes liquid bleach, though it can also be used to make chlorine gas. Ammonium nitrate is used as both a fertilizer and a mining explosive. They theorize that The Hellgrammite may be building a chemical bar. Hellgrammites are an insectoid species, but they can camouflage themselves into any shape they want. Winn notes that a fulled-.loaded ambulance weights 9200 pounds - just over 4.5 tons. This means Kara needs to use a maximum of 44,498 Newtons of force to move it. The Hellgrammite is a chlorine-based life form, rather than a carbon-based one like all life on Earth. Alex realizes all of the chemical plants The Hellgrammite robbed were used to store DDT - a chlorine-based pesticide. She theorizes that The Hellgrammite has been eating the DDT as it is one of the few things on the planet it can eat safely. The DEO sets up a private room that only Kara can open, containing an hologram generated by an interactive artificial intelligence program that was on the rocket that carried Kara to Earth. This hologram looks like Alura In-Ze and can answer any question based on her experience and knowledge. Supergirl: For the last 12 years I hid who I was. I don't have to anymore. And I don't want to waste a minute of it. Besides, this sounds like a job for Supergirl. James: Kara, look out the window. Tell me what you see. James: I see a city full of people who need help. Who need a hero. Kara: You really think so? James: If anybody can fill Superman's boots, it's you. Supergirl: I thought you said it was a cat? Winn: Who names their snake "Fluffy"? Alex: Do you really think it was a good idea to tell your friends who you are? Kara: Yes. Because they're my friends. James: You know, it's been like this for a while. Back when I first started, I was this nervous kid with his camera, just trying to get noticed. And then one day, everybody knew my name. And not because of anything *I* did. Not really. Because I was friends with somebody who was making a difference. I dunno - I just thought... I could escape all that if I moved here. Be my own man, you know? Kara: Back on Krypton, no one was their own man. Growing up, I was taught that to accept help from people is not a shame. It's an honor. James: Your cousin never talks about Krypton. Kara: He was a baby when we left. But I remember it. All the time. Did he ever tell you what that "S" means? Kara: Yes, but it also stands for a Kryptonian phrase. Our family motto - "El mayarah". It means "stronger together". You say people will see me the way they see Superman one day. But I don't want to be a hero like him! My cousin - he's so used to going it alone. He doesn't know any other way. But I do. I see it now! You, Winn, my sister, Ms. Grant even. You all showed me that! James... part of being your own man is knowing when to accept help. James: You really want to do that interview? Kara: For what we're trying to do here together. For us. Astra: I let one planet die. I will not do so again. Supergirl: Funny. I was going to say the same thing. Alura AI: Whatever it is you wish you could ask Alura, you may ask me. Kara: (starting to tear up) I'd ask for a hug. Alura AI: I'm not programmed to do that. Kara; (sniffling and then steeling herself before speaking again) Then tell me about my Aunt Astra. Supergirl: Are these tests mandatory for everyone? Or just because I'm a- ? Dir. Henshaw: It is not because you're a woman, Miss Danvers. The DEO requires rigorous physical and psychological evaluation for all perspective field operatives. Supergirl: I was going to say "alien". Supergirl can fly faster than the speed of sound. Alex Danvers trained for a full year with the DEO before she was allowed into the field. According to Maxwell Lord, the city maintenance budgets for Metropolis have quadrupled since Superman's arrival. Lord blames this entirely on metahuman fights in the city. Winn Schott's idol is Maxwell Lord. He owns several of Lord's watches as well as his biography and autobiography. Kara is aware that Clark Kent is Superman. Kara's father has many fine qualities but he is a terrible cook. Alura In-Ze was an adjudicator - a Kryptonian position equivalent to a prosecuting attorney. The Military Guild is a Kryptonian peace-keeping force, combining the roles of soldiers and police officers. It is they who arrested The Hellgrammite on Krypton. Kara refers to her defeat of Vartox in 101. Apparently only the DEO knows about the existence of Kryptonite. At the very least, it is not public knowledge. Alex Danvers spent twelve hours a day for five months doing nothing but combat training when she joined the DEO. Kara has no formal combat training. Both Winn and James are astonished to learn that the other one knows Kara's secret identity as well. Together, they work on helping inform Kara about trouble Supergirl can help with. The leader of the Kryptonian criminals on Earth is General Astra In-Ze. She is Supergirl's aunt, the twin sister of her mother Alura In-Ze. She is apparently bullying the other escaped prisoners into working for her. Kara was scared of the Danvers' popcorn maker as a girl. The Hellgrammite robbed six chemical plants around the USA over the past year. "El mayarah" is the family motto of The House of El and the symbol relating to that phrase is their coat of arms (i.e. The S-Shield worn by Superman and Supergirl). Translated from Kryptonian, it means "stronger together". Director Henshaw had a family at some point. Astra confirms that she and Alura were twin sisters. She notes that twins were rare on Krypton. She says that her goals are to save humanity - not kill it, but does not elaborate on that plan. Astra was imprisoned in The Phantom Zone by Alura for "speaking the truth, while she told only lies" and "being a hero and trying to save their world." Kara says that Astra taught her the names of all the stars as a girl. Director Henshaw is armed with a kryptonite knife. Kara asks Alex to teach her how to fight. Alex reveals the AI room with the hologram of Alura to Kara. It was built at Alex's request as a favor from Director Henshaw. Henshaw's eyes flash red as he walks away from Alex near the episode's end. 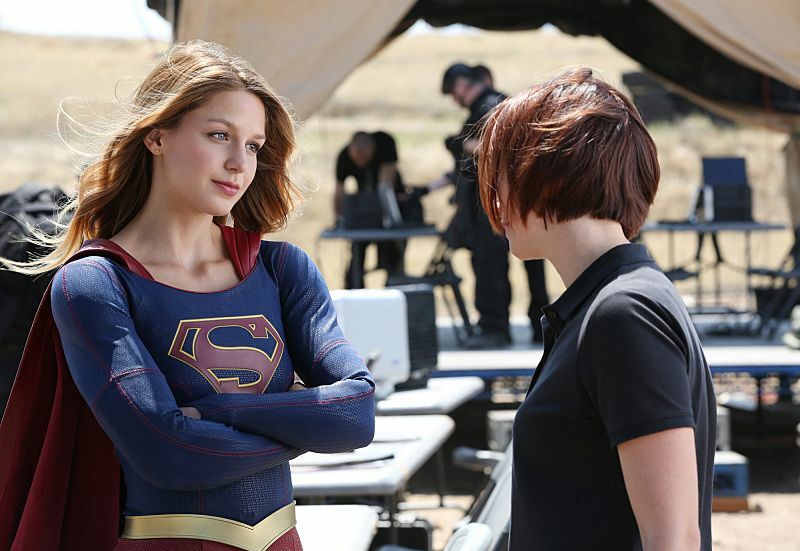 Cat Grant gets her interview with Supergirl, though the episode ends before we hear it. Kara makes a few rookie mistakes early on but seems to be given a harder time about it because of her gender. A marked improvement on the first episode. It's gratifying to see they won't be dragging out the mystery of who the mysterious general is and that the Astra/Alura/Kara triangle has been established this soon. The best bits of the show continue to be James and Kara playing off one another. The action sequences are largely excellent, though the final fight between Astra and Kara is shot a little too close. Really, the only serious complaint I have is that I wish Winn would get some more development beyond being the quirky geek guy.